Several other scientists are utilizing the CTD casts in their projects. The first thing that is done when the CTD is brought to the surface is to collect what we have been calling the “Dickson” sample A .5 liter sea water sample is collected from the surface and then capped using a small bench-top press. These samples are sent to the Scripps Institution of Oceanography in San Diego and are analyzed for dissolved inorganic carbon. This procedure is done by the Survey Technician, and yours truly has learned to do it. Also, scientist Charles Gutter-Johnson, from Bloomsburg University, uses the CTD water samples for the Monterey Bay Aquarium Research Institute research. This involves taking chlorophyll and nutrient samples using a bench-top flourometer. Charles also works to collect barnacles off the retrieved buoys for the Bloomsburg University Barnacle Census. Tom Nolan from NASA’s Jet Propulsion Laboratory has been calibrating his instrument, called the MISR, which stands for Multi-angle Imaging SpectroRadiometer. What Tom is doing is checking this instrument against NASA’s satellite in order to check its calibration. The instrument basically looks like a small oblong box, which he points to the sun to get a reading, and then down at the ocean to get another reading. Tom Nolan, from NASA’s Jet Propulsion Lab, calibrates the Multi-angle Imaging SpectroRadiometer (MISR). These checks have to be done at precise times in order to catch the satellite in its orbit overhead. The satellite images are used in weather forecasting and tracking of storms, such as hurricane Isabel. Here is the website address for viewing the satellite image of Isabel taken by MISR: http://www-misr.jpl.nasa.gov. I would love to look at the image myself, but we do not have the internet on the KA. I would also like to give you a website address where you can view a labeled diagram of a buoy. It is: http://www.pmel.noaa.gov/tao/images/nexgen.gif. Here is a question for you: why do the buoys measure conductivity? To give you somewhat of a hint, conductivity is actually measuring the salinity of the ocean water. How does salinity relate to ocean currents? Today we dedicated the TAO buoy to Naalehu Elementary and Intermediate School! 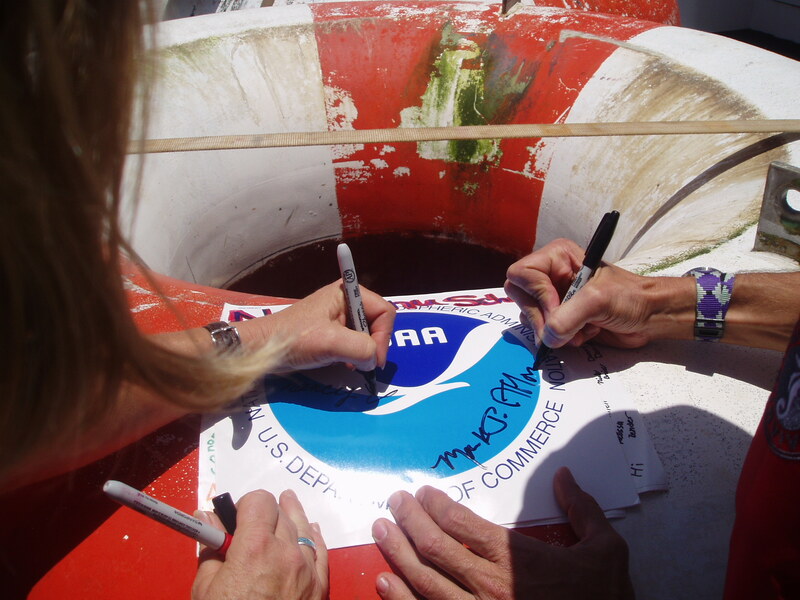 On a large NOAA sticker, I wrote the name of our school, and we had a dedication ceremony where the Captain, John Kermond, our videographer, Tom Nolan and myself signed the sticker. Captain Ablondi and myself then fixed the sticker to the central shaft of the buoy, which is above the water. 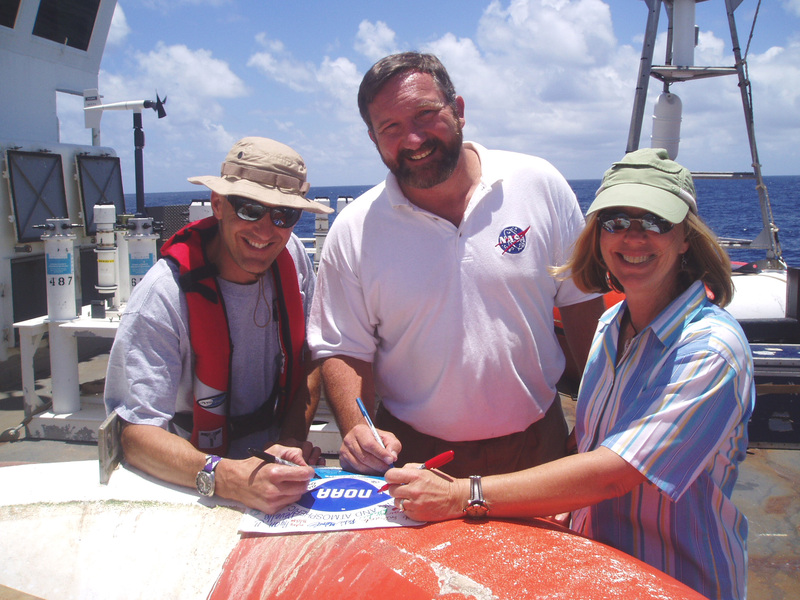 CO Ablondi, scientist Tom Nolan, and TAS Nancy Lewis dedicate a buoy to Na’alehu School. I am very proud to be a part of the Teacher at Sea program, and be able to share the work on the KA’IMIMOANA of climate observation. I hope to inspire many of the students at my school, and at schools around the country to a greater interest and study of science, and in particular earth science and oceanography. If we fail to care for the oceans (and it is all one big ocean despite our giving them separate names) we risk upsetting the entire ecosystem of this planet. We need the next generation, those of you in school now, to learn as much as they can about this planet, the waters that cover 70% of it, and the atmosphere above us. We finished filming this afternoon just before sunset, and would like to see who can answer this “brain teaser” of a question: Why does the ocean foam? Even I do not know the answer to this question, and I pose it for all you budding young scientists out there. The game tournaments have begun, and I just learned how to place the card game “Sequence”. Tom is my partner and we won 2 out of 3 games that we played against Nicole Colasacco, the Field Operations Officer (the FOO) and Curt Redman, Engine Utilityman. The championship game will be against Doc and the CO (Commanding Officer), Mark Ablondi. According to Doc, whoever wins the first round will be going down when they play her and the CO. We’ll see! Questions of the Day: Quiz for prizes! First prize will be a KA’IMIMOANA T-shirt, Second prize a ship’s baseball cap, and Third prize a special KA’IMIMOANA patch. Name the world’s 5 oceans. Which one is the largest? How many island groups make up French Polynesia and what are their names? 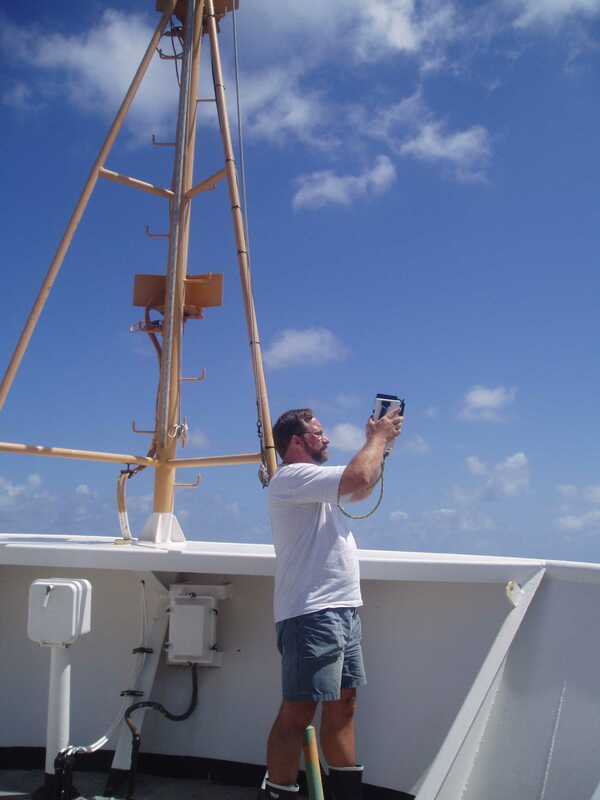 This entry was posted in 2003, Nancy Lewis, NOAA Teacher at Sea and tagged CTD, inorganic carbon, Jet Propulsion Laboratory, MISR, noaa ship ka'imimoana, tao buoy, TAO/TRITON. Bookmark the permalink.